Trying to find LG DVD remote codes? 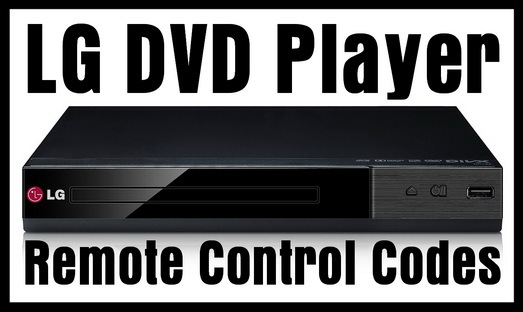 If you have a LG DVD player and want to control it with a universal remote control, we have the codes needed. A LG DVD player can be controlled with any universal remote if you have the correct programming guide and the correct remote codes. If the codes below do not work with your LG DVD player, please leave a comment below with the model number of your remote control and DVD player and we will find you the correct remote code. Program your universal remote control to a LG DVD player. Use the following remote codes. Need more help programming your remote to your LG DVD player? Please leave your question below and we will assist. How do I enter the codes for the DVD player (LG) or what buttons do I press to or hold to do the codes. Can you please show me how. my remote is a RCA universal remote..
I’m using a dish universal remote and pressing 1 after flash before the code and then # to get LG Blu Ray DvD Player to work and hasn’t done so yet. Without a remote and I can’t press play only got eject and power. Do you think it may work if I get DirecTV universal remote and hold select and mute? How to set a code in order for universal remote to work? I used to have the code for the LG DVD player. But I haven’t used it in months and I have forgotten the code to make the RCA remote work for it. Can I get the codes for Nb09321 LG DVD player? Remote did not work using code search or manually inputting codes for LG DVD BPM34. I bought a universal remote control but that accepts 3 digits only. I need the code for my LG blueray BD550 to program into my universal remote. I’ve tried every code, not work. LG DVD DP132 model. I see there are many request for this same situation….but no answer. I hope I get an answer….or even if this remote is compatible for this model player. how can I enter the remote codes to a LG blueray DVD player model BP620-N? It has only four buttons at the front: eject, play/pause, , power. My smart TV and universal controller are Samsung. I need a code that will work for an LG DP132 DVD player. I have a Sony Trinitron with a Sony RM Y195 remote. Can I set my Hisense en-33926a Smart TV remote to control my LG DVD player? Can i program my LG dvd player with the original remote that came with the Hisense TV I bought? I have a QC g121404 universal remote and I need the code for my lg dvd player. I have a GE universal remote and a LG DVD/CD player. I can’t find the right code for it. Help Please! Remote model number is Samsung HLS4266WX-XAA. DVD player model number is dn898 and is LG Brand. I have a Philips universal remote model src206327 and an LG DVD player dp132. Have you tried using the LG DVD Player Remote Codes 1906, 0869, and 1983? Hold down the code search button until it lights, then press the VCR button. There is no DVD button. A steady red light should be on. At this point, you can enter the code that works for your DVD player. The model number is on the back of the player.